to 100 pieces and if we have bettered last years design we shall be very surprised?? Entry;- As is customary the doors will open at 11 o’clock with the usual sixty minute warm-up period. With the days timetable commencing at noon. Stall/Table holders will be permitted earlier admittance should they require it? Location;- The map we keep promising to provide continues to elude us but in recent times no one has raised any issues with us over this. As in the past here is the full postal address;- Visitation Parish Centre, adj. 358, Greenford Road, Greenford, Middlesex, UB6 9AN. Should this cause problems then if you find what is the largest Roman Catholic school in the country and is known as the ‘Cardinal Wiseman R/C School’. Then you are there!! Accommodation;- For a number of years we have been suggesting ‘The Bridge’ which is situated on the Greenford A40M roundabout, on the north east side if you like? Their telephone number is 0208-566-6246 or the e-mail address is bridgehotel@youngs.co.uk. Tables;- The stall price for this year has been reduced to £15-00 each for a size of 4’ x 2’ until the 26th August, after which they are £25-00 to all. You also are required to have a day ticket for the event in order to hire a table. 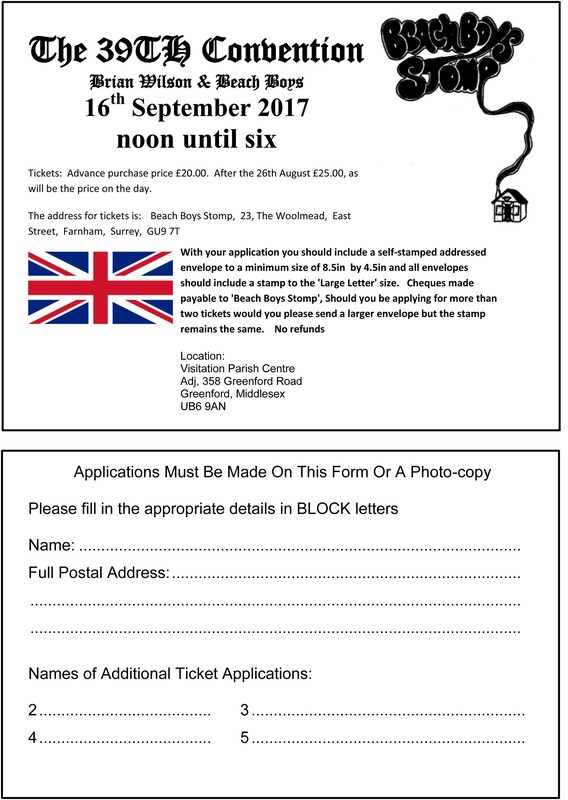 The table form is also available from the ticket address printed elsewhere, Please remember to also send an S.S.A.E. ANYONE WISHING TO SELL OR TRADE ANYTHING MUST HAVE A TABLE!!! Auction;- This attraction may be withheld this year as we have not been able to locate the type of items we would normally wish to offer. The Silver/Gold discs have had to be put on hold as Capitol Records is now owned by Universal and they hold all the U.K. papers but they do not have the staff to deal with this type of enquiry. Thus at the moment we are unable to seek the certification of these discs by the B.P.I. Raffle;- If the Auction isn’t what we were wishing for then the Raffle more than makes up for it! So as you all know by now all the items on offer will have at least one autograph but do please remember most are on photo-copies!! As ever tickets are £1-00 for a strip of five and can be purchased from the ever buoyant, Miss Angela ‘Jardine’ Gibbons!! Data Protection Act;- As in the past if you do not wish to see your picture in the magazine, then please avoid having it taken by Mr. Brian Clarke. Should you be part of a group picture, or not directly looking at the camera then the D.P.A. does not apply. Refreshments;- As last year only the Bar on the second floor will be open with teas, coffees and very light refreshments. What we are always asked to stress is NO-ONE is permitted to bring in any form of drink which has been purchased from elsewhere!! “Special Guest” This aspect of the event was mentioned at the start of the event details a copy of which is not available to us at this time, so if anything is being repeated, we apologise! Our Guest of 2016 was very Special and was only the second time we have taken somebody from the lower age group. Thus for this 38th event we are back to the golden years with ‘The Honey’s and Mrs. Ginger Blake who as I am sure you all, or most of you know is a cousin of Marilyn’s and was very keen to indeed to attend our event here in 2017 when initially approached last October. Mrs. Ginger Blake will be accompanied by her husband who will be on his first visit to England. Timetable;- We are very pleased to announce having requested to step down from his position in the ‘Beach Boys Stomp’ set-up Geoff Gilborson has very kindly agreed to continue with his most excellent addition to the day, of a programme. As mentioned before each attraction will have a fifteen minute break before the next item on the timetable. Mobile Telephones;- If you wish to receive or make a call could you kindly go down to the middle floor or preferably outside the building all together. Please ensure whilst actually in the event room all mobiles are switched off!! Copyright;- No part of the event can be taken and used in any form of commercial reproduction. Without , in the first instance seeking permission from ‘Beach Boys Stomp’. NOTICE;- THE ORGANIZERS RESERVE THE RIGHT TO MAKE ANY ADJUSTMENTS OR ALTERATIONS DEEM NECESSARY WITHOUT NOTICE!! Roy Gudge Tuesday 25th July 2017.